With spring finally upon us, I am so, so ready for new spring work wear. It’s so nice to pack away the heavy suits and opt for lighter, softer pieces for work. 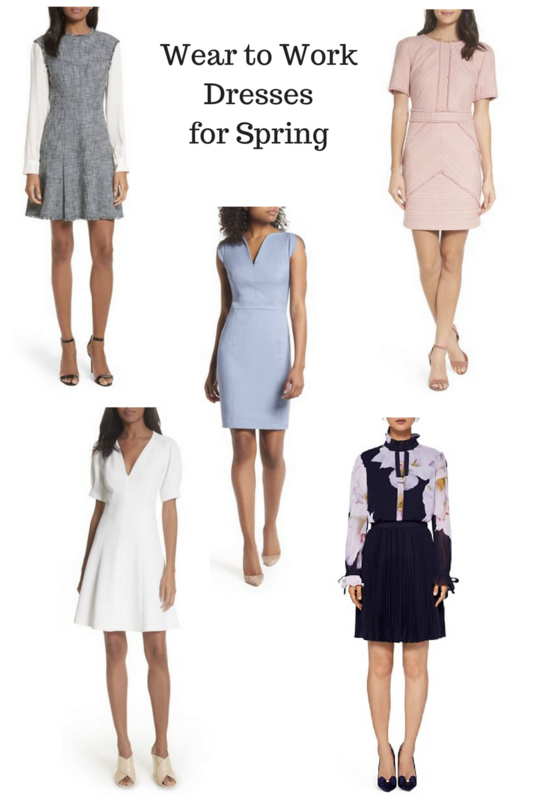 Today I wanted to focus specifically on spring dresses, and share my top picks for wear to work dresses this spring. These dresses are perfect for the getting-warmer weather but are still professional and work day appropriate. I’ve included all my top picks in the collages below. Click on any dress be taken directly to the product link. Read on below for more on what the trends are for spring and why I am loving these particular spring dresses. What i love about the wear to work dress options this spring is the variety of fabrics! Usually work wear is pretty straightforward without much differentiation in fabrics from year to year. This year though, we are seeing designers and brands experimenting with a variety of fabrics from tweed, to chiffon to scuba material! If you missed my post on Tweed for spring; be sure to check that out as well! In addition to the bold fabrics there are a number of beautiful colors on dresses this spring. Case and point, the blue dress below. How stunning is that shade?! There is also a lot of pretty details on dresses this spring; and I am a huge sucker for the little details when it comes to fashion! As you can see on these dresses; there are details from bow tie sleeves, puff sleeves, and even unique stitching/shaping. I can’t wait to start wearing these spring dresses to the office; I just need the Vancouver weather to cooperate! It is still freezing here! I hope you enjoy all of these dress picks, and that wherever you live is warmer so you that you can start wearing them ASAP haha. "The Fashion Trend I Never Thought I’d Wear"
Ohhh I love those dresses! So many pretty options! Thanks Liz!! I know; too many pretty choices haha. I’m going to be giving myself a spring shopping budget, so hopefully I’ll stick to it and not get too many of these! These dresses are so pretty. I love your picks. These dresses are so cute!! I would even wear them outside of work! Totally agree! They’d be great for a Sunday dinner or Saturday brunch! Thanks for stopping by! Thanks Jana! I totally agree! I love that it feels springy with the floral pattern, but the longsleeves make it feel perfect for March/April when the weather is still a bit cold! These are all so great! And I love that you can wear them out of work as well. Thank you! So glad you like them. I totally agree; they’re good pieces because they are so versatile!